Restoration and on-ground works is a top priority for both the Catchment Group and the Habitat Brisbane bushcare groups. As urban development continues to put increasing pressure on our environment the need to step in and reverse vegetation loss and improve the condition of existing bushland areas if more important than ever. Providing opportunities for local businesses to get involved through corporate volunteering or sponsoring sites. The Mookinbah bushcare group meets each last Saturday of the month at 108 Greencamp Road. Contact Keith Brown on 3396 9504 for more information. The Harman’s Reserve bushcare team meet every third Sunday of the month by the Scout Hall on Wood Street at 8.30am. Contact Gayle Jensen on 0423 845 237. The Mossvale on Manly crew meet on every second Saturday of the month nice and early from 6.30am. Contact Pat Boadle on 0402 717 380 for more information. The Wynnum Creek group meet every 2nd Saturday from 3-5pm. Contact Robyn at info@baysidecreeks.org.au for more information. 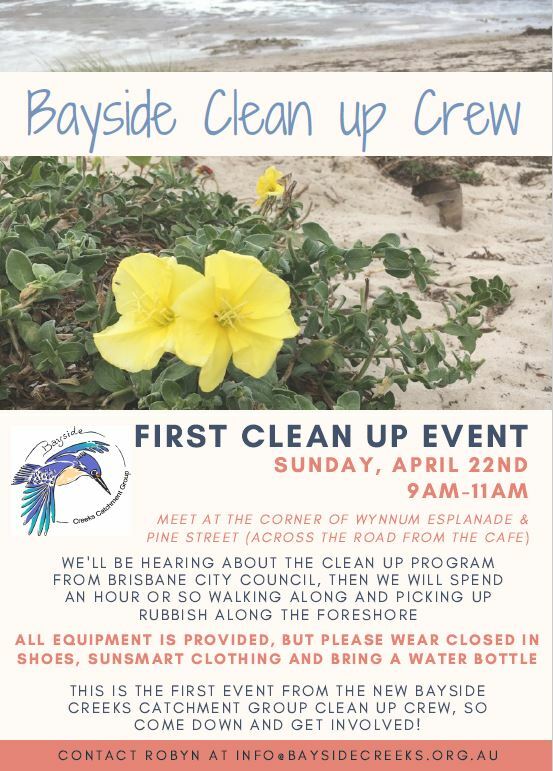 The new Bayside Clean Up Crew will tour the area once a month to pick up rubbish and help keep our catchments and the beautiful Moreton Bay clean and healthy. They meet once a month on Sundays (changable due to tide times). For further details contact Sonya (text only) on 0447 336 103 or email sonyakerslake@gmail.com.